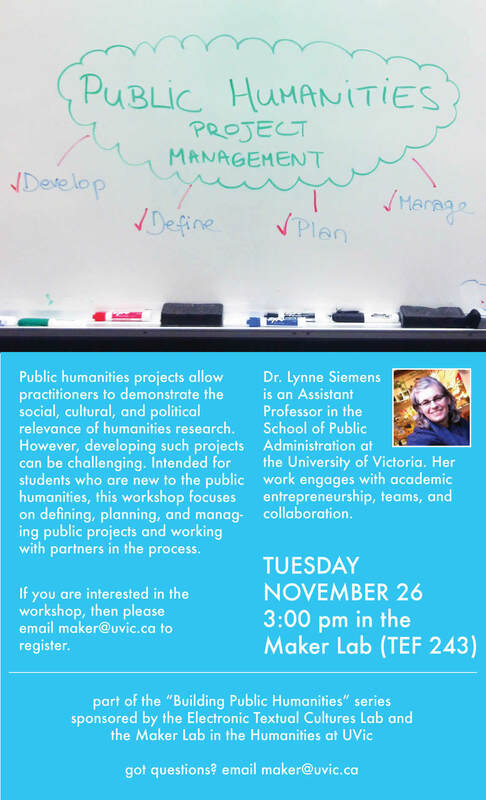 On November 26th, as part of the “Building Public Humanities” project and the “Hello World” workshop series, and with support from the Electronic Textual Cultures Lab and the Maker Lab in the Humanities, Lynne Siemens will be leading a workshop on managing public humanities projects. Siemens is an Assistant Professor in the School of Public Administration at the University of Victoria. Her work focuses on academic entrepreneurship, teams, and collaboration. During this workshop we will look at methods to develop, define, plan, and manage successful public humanities projects that allow scholars to share content with a wider audience, work with partners, and demonstrate the social, cultural, and political relevance of humanities research. Graduate students are especially encouraged to attend. Post by Nina Belojevic, attached to the HelloWorld and BuildingPH projects, with the news tag. Poster for the event care of Nina Belojevic and Jon Johnson.